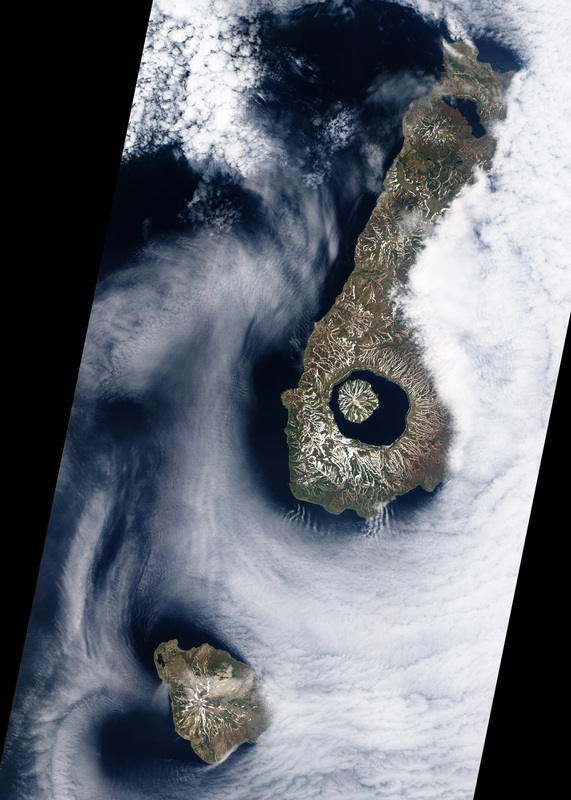 More than 9,000 years ago, a catastrophic volcanic eruption created a huge caldera on the southern end of Onekotan Island, one of the Kuril Islands, located off the southern tip of Russia’s Kamchatka Peninsula. Today, the ancient Tao-Rusyr Caldera is filled by the deep blue waters of Kal’tsevoe Lake. 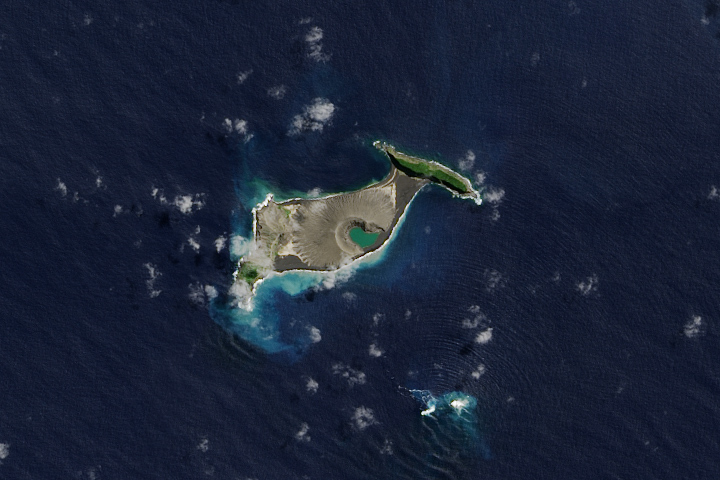 The Advanced Land Imager (ALI) on NASA’s Earth Observing-1 (EO-1) satellite acquired this true-color image of southern Onekotan on June 10, 2009. In this late-spring shot, snow or ice lingers on the land, forming white streaks on a brown-and-green land surface. In the northwest quadrant of the caldera is Krenitzyn Peak, which rises to a height of 1,325 meters (4,347 feet). 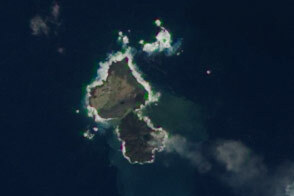 Like the other Kuril Islands, Onekotan lies along the Pacific “Ring of Fire.” The Kuril Island volcanoes are fueled by magma generated by the subduction of the Pacific Plate under the Eurasian Plate, which takes place along a deep trench about 200 kilometers (120 miles) to the islands’ east. The only historical eruption at Krenitzyn Peak occurred in 1952, a week after a magnitude 9.0 earthquake along the subduction fault. NASA Earth Observatory image created by Robert Simmon, using EO-1 ALI data provided courtesy of the NASA EO-1 team. Caption by Michon Scott and Rebecca Lindsey. 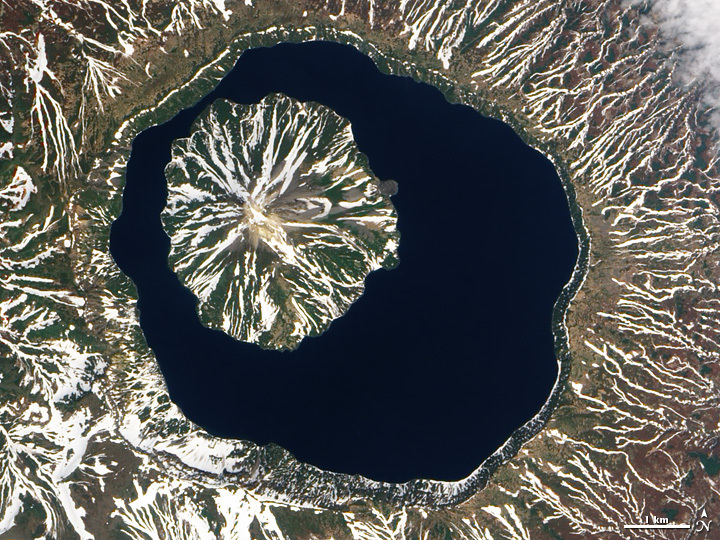 Krenitzyn Peak rises from lake-filled Tao-Rusyr Caldera on southern Onekotan Island in this natural-color image from June 10, 2009. Ishizuka, Y. (n.d.) Volcanic Activity and Recent Tephras in the Kuril Islands: Field Result during the International Kuril Island Project (IKIP) 2000. Accessed October 23, 2009. Walter, T., and Amelung, F. (2007). Volcanic eruptions following M Ã¢â°Â¥ 9 megathrust earthquakes: Implications for the Sumatra-Andaman volcanoes. Geology, 35(6), 539-542. Wikipedia. (2009). Tao-Rusyr Caldera. Accessed October 23, 2009.